Why are we so obsessed with GDP? Change the Lens, Change the Story ! Reading habits are now limited to Pictorials & Meme shared over WhatsApp & Social Media. The daily dose of Newspaper headlines are remotely connected to the reality. Evening prime-time is spent on 'Newstainment' - the cacophony of futile & vile debates. New-age, so-called 'fact-checkers' are mostly 'Google Warriors' with hidden Agenda. Facts & Data gets buried somewhere deep under all this rubble, crying for time & attention. Both have turned out to be highly emotive issues for India - for those who understand it and even for those who don't. Emotion, connects India. 'Designer Journalists' got busy drafting lengthy editorials, slanted, biased & twisted. 'Eminent-Economists' started practicing social-engineering once again. Narrative # 2: GDP growth for Q1FY1718 dropped to the lowest in 3 years and hence the economy is badly hurt due to DeMo. Let us now try to apply some simple common sense to the facts & data with respect to DeMo & GDP, as available in public domain. And, we shall soon arrive at some clarity. First, the bigger demon of the two - DeMonetisation (DeMo). 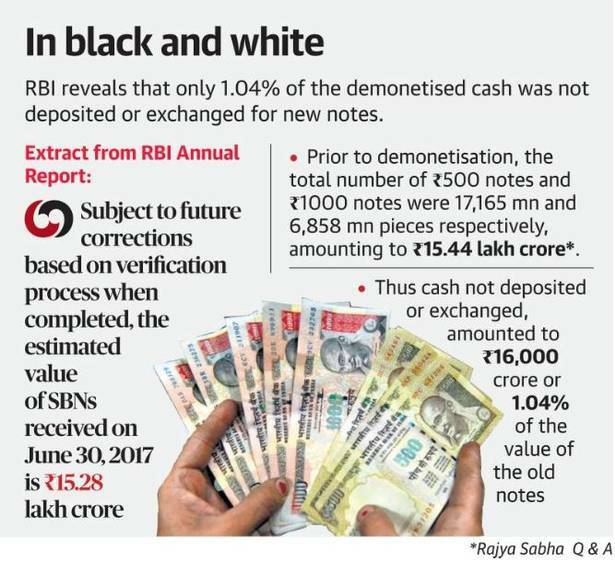 As soon as RBI came out with the Data, within minutes a section of eminent-economists concluded that since 99% of the demonetised currency came back to the Treasury, DeMo has utterly failed in its objective of brining Black Money. We had discussed DeMo earlier in March 2017 on THEY Demonized Demonetisation - We had discussed in detail the several objectives of Demonetisation then and also the 'Creative' myths the media & opposition tried to invent around it. The Government of India decided to cancel the Legal Tender Status of Rs.1000 and Rs.500 denomination currency notes on 8th November 2016 with several objectives: (i) flushing out black money, (ii) eliminate Fake Indian Currency Notes (FICN), (iii) to strike at the root of financing of terrorism and left wing extremism, (iv) to convert non-formal economy into a formal economy to expand tax base and employment and (v) to give a big boost to digitalization of payments to make India a less cash economy. Some people had expected a very large shock to economic growth on account of demonetization. Their expectations have been belied. All the noise & chatter terming DeMo as a failure is based on the flawed presumption that DeMo was a single-Objective exercise for Black Money. The fact is there are multiple objectives to DeMo. A series of actions triggered as a follow-up to DeMo, need to be factored & assessed before quickly jumping to conclude the failure of DeMo, or otherwise. 29,000 Crores worth of Undisclosed income (again, Black Money) was brought into the banking system under IDS, prior to DeMo. 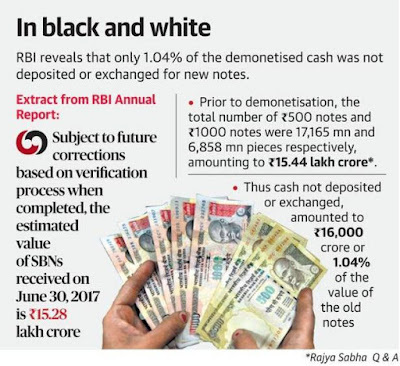 De-Legalised currency notes NOT deposited amounts to 16,000 Crores (Black Money). So, from a common man's perspective, the government has indeed effectively flushed out Black Money to the extent of 3.35 Lakh Crores. The aggressively funded, SEO & HashTag energised web-mags, that invade the privacy of our digital lives every single hour via Facebook and Twitter, will never bring these facts to light. 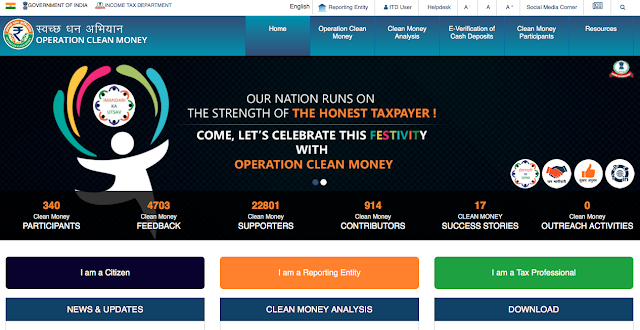 Income Tax Department (ITD) has initiated Operation Clean Money, today. Initial phase of the operation involves e-verification of large cash deposits made during 9th November to 30th December 2016. Data analytics has been used for comparing the demonetisation data with information in ITD databases. In the first batch, around 18 lakh persons have been identified in whose case, cash transactions do not appear to be in line with the tax payer's profile. Under the first phase of 'Operation Clean Money', the tax department had sent communications to 17.92 lakh people who had made suspicious deposits of Rs 5 lakh and above between November 10 and December 30. Next up: Operation Clean Money II - Portal ( https://www.cleanmoney.gov.in ) was formally launched on 16-May-2017. Providing comprehensive information at one place. Enabling Citizen Engagement for creating a tax compliant society. Let us go beyond these headlines, read the fine print, apply basic common sense to it and get some clarity. The economic activities which registered growth of over 7% in Q1 of 2017-18 over Q1 of 2016-17 are 'trade, hotels, transport & communication and services related to broadcasting', 'public administration, defence and other services' and 'electricity, gas, water supply & other utility services'. The growth in the 'agriculture, forestry and fishing', 'mining and quarrying', 'manufacturing', 'construction' and financial, insurance, real estate and professional services is estimated to be 2.3%, (-) 0.7%, 1.2%, 2.0% and 6.4% respectively during this period. Construction: 2 % , as against 11 % last 5 years. Rs 30 lakh crore (or 20 per cent of the GDP) constitutes India's 'black economy'. A huge crisis averted: Asset prices in India rose by ten times in those six years (2004-2010) as compared to the earlier five years (1999-2004); stocks by 311 per cent against 32 per cent in the earlier five years; gold by 320 per cent against 38 per cent; and land by 200-2,000 per cent, in different places, against 21 per cent. It is self-evident that when a huge volume of cash is withdrawn from the economy, growth will suffer. But what was implicit in de-mon itself became the charge against it. But this bitter pill was inevitable to course-correct the economy. Liases Foras also pointed out that residential sales across the top eight cities of India had increased, taking the total growth to around 28 per cent post de-mon. This basically means that 'lower income group' that put their hard earned money into Residential purchase have actually grown @ 28% post-DeMo. Designer Journalists are a 'limited edition' breed as far as their understanding of anything remotely connected to economics goes. No, the 'Eminent Economists' will never tell this part of the story. This is what we call as building a 'Narrative'. Before I talk about the Tata Aria and my experience of 100,000 KM journey with it, it would be necessary to go back in time and rewind to discuss how I arrived at this mean machine. Earlier, I drove Tata Safari, about 120,000 KMs. Let us not try to look for any reasons into my fascination with Tata. To put it simple and straight - even today, I am a big fan of Tata Safari. Moreover, with a large family of Five to drive along, it turned out to be more of a necessity than anything else. Two very significant members of our family needed fairly large space. Zara & Marshal - the wonderful lovely couple of German Shepherd. They both loved being driven around and would jump onto the boot as soon as the rear door is opened; and Zara, would refuse to come out as she wouldn't like to be left behind. Furthermore, being a family of ‘Nature and Wildlife’ enthusiasts, any opportunity of a small get-away and we prefer to look for an off-road destination.